Partnerships drive the customized programming and service offerings for TERRA. 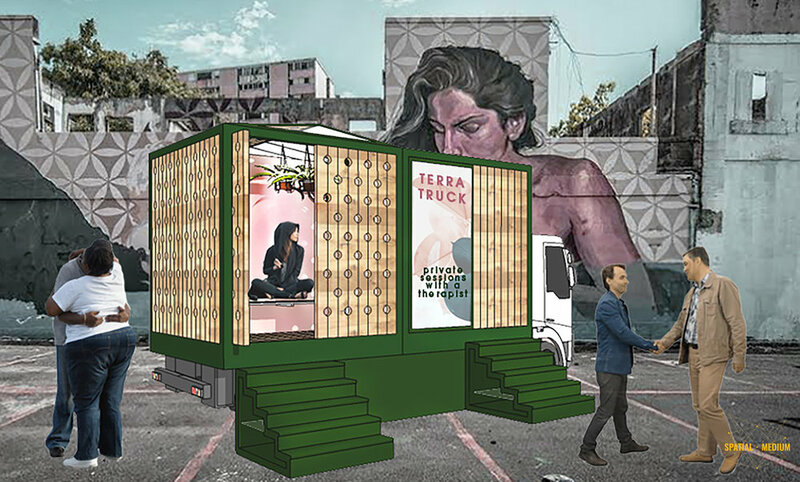 Through our truck + mortar model, those leading the mental health conversation are able to bring targeted programming directly to groups in need, exactly when they need it. With trucks that are dedicated to Public Crisis Relief, Guerrilla Outreach, Targeted Education, and On-demand Treatment, we are able to customize each experience to the strategic goals of our partners. Regardless of stigma, we can immediately assist communities on the ground during public crisis events across the globe. Because of the modular construction, trucks can easily be dismantled and shipped where needed. Each effort is led by local mental health practitioners unless further support is required and future build-outs can include bed and toilet facilities. Social interactions are the gateway into creating a stigma-free culture. By creating interactive experiences geared towards sparking curiosity, we can begin to introduce populations unfamiliar with self-care strategies. Educational environments open up, expanding to accommodate small groups while still maintaining a dedicated space for learning. Collaborators include our law enforcement, schools, religious organizations, and LGBTQ centers as well as other groups looking for more targeted information. Our treatment environments provide private, safe and healing environments for individuals to receive specific care. We envision serving our more isolated demographics such as seniors, home-bound caregivers, and new moms as well as partnering with local organizations for a day of pre-scheduled treatment for their community. 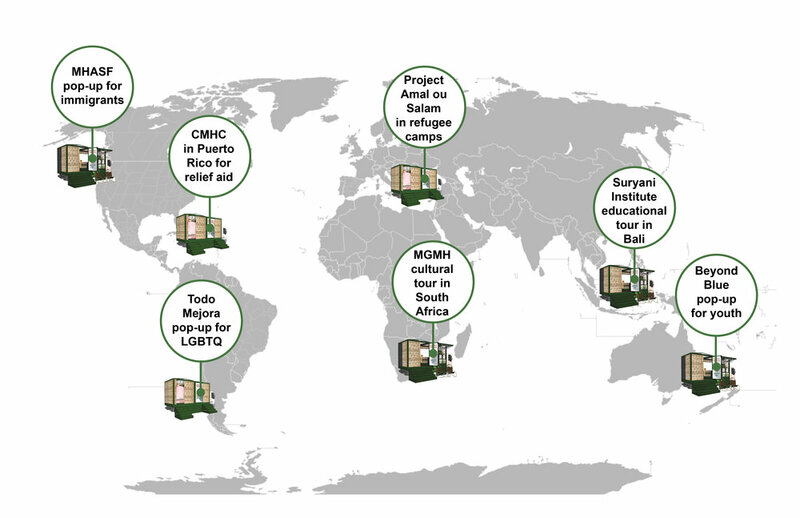 Illustrated below are potential TERRA Mobile partnerships across the globe, providing local organizations with a vehicle to facilitate targeted experiences for their communities. Interior panels are used to prompt activity, support program functions, and create ambiance. We have four general types: Connecting, Living, Healing, and Storytelling. Although our stories may be different, we are not alone. These walls are always interactive and allow for individuals to share their stories anonymously either by physical touch or audio. Our multi-disciplinary team came together to solve a design challenge from the Van Alen Institute (inspired by Mayor DeBlasio's campaign ThriveNYC) on mental health support and quickly realized that our passion and desire to shift the conversation was much larger than our hometown of New York City. With a community-focused mission and expertise in Design, Cultural Strategy, Horticulture, and Strategic Planning, we qualified for the finals and walked away with a 2nd place/honorable mention win. create the potential for organizations across all sectors to support individuals in learning/sharing their stories and creating better self-care routines. facilitate a future where mental health is stigma-free and out-of-the-closet. spark a global movement for accessible, affordable, and safe mental health treatment for all. If you are interested in helping TERRA become a reality and resource to our trusted mental health partners, please contact us here. By coming together, we can eliminate this health epidemic to build more connected and resilient communities - join us!